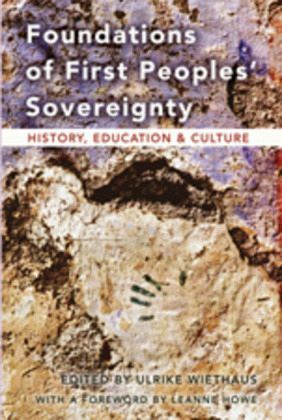 Foundations of First Peoples' Sovereignty is an innovative collection of essays offering interdisciplinary perspectives on the topic of sovereignty for Indigenous nations. Presenting contemporary initiatives and scholarship in the humanities on behalf of First Peoples, the volume affirms and explores the dynamic interplay between tribal community action and reflection, academic work, and the commonalities shared by Indigenous nations globally. The Editor: Ulrike Wiethaus is Professor of the Humanities in Interdisciplinary Appointments at Wake Forest University. The author of numerous books and articles on the history of Christian spirituality, she has been involved in community partnership collaborations with American Indian organizations in South Dakota and North Carolina for several years. Her interdisciplinary projects include two documentaries co-produced with Lakota elder Harry Charger, Lakota Language Revitalization: Interviews with Elders on the Cheyenne River Reservation, South Dakota (2005) and The Seven Rites of the Lakota (2008). Contents: LeAnne Howe: In the Place of a Foreword: Still Code Talking - Ulrike Wiethaus: Introduction - David E. Wilkins: Indigenous Self-Determination: A Global Perspective - Matthew D. Herman: "The Making of Relatives": Sovereignty and Cosmopolitan Democracies - Kauila Clark: Pondering Sovereignty for Native Hawaiians - Malinda M. Maynor: Practicing Sovereignty: Lumbee Identity, Tribal Factionalism, and Federal Recognition, 1932-1934 - E. Fred Sanders/Thomas J. Blumer: The Catawba Nation under Siege: A Troubled History of Tribal Sovereignty - Lawrence Shorty: Reclaiming Health as an Act of Self-Determination: Tobacco Addiction Resistance - David Kekaulike Sing: ' Ike Pono : Promoting Learning from a Native Hawaiian Perspective - Harry Charger/Ione V. Quigley/Ulrike Wiethaus: Foundations of Lakota Sovereignty - J. T. Garrett: "Full Circle Gathering": The Healing of a Nation - Thomas Belt/Margaret Bender: Speaking Difference to Power: The Importance of Linguistic Sovereignty - Jeanne Simonelli/Josefa Hernandez Perez/La Fomma: Pathway to Autonomy: Women's Testimony of the Chiapas Experience - Eva Marie Garroutte: Challenging Authenticity: Contemporary Artists' Contributions to American Indian Intellectual Sovereignty.